Some of my readers may remember my Advent Calendar from a few years ago. It was truly a labor of love, but even after all that work I’ve decided not to use it this year. However, I know how much kids love countdowns and anticipation, so I wanted to have some sort of advent calendar. My desire was to have something smaller (more like a larger photo frame size) that would be an easy DIY. I didn’t want to have to include anything expensive- like a toy every day- in the calendar, and I didn’t want to use candy. My daughter gets enough candy without getting it at home every day. Then the absolute perfect idea hit me! Gum! Sugar-free gum, like Extra gum sticks, would be a great non-candy option that would be small enough to fit onto a holiday advent calendar Christmas craft. 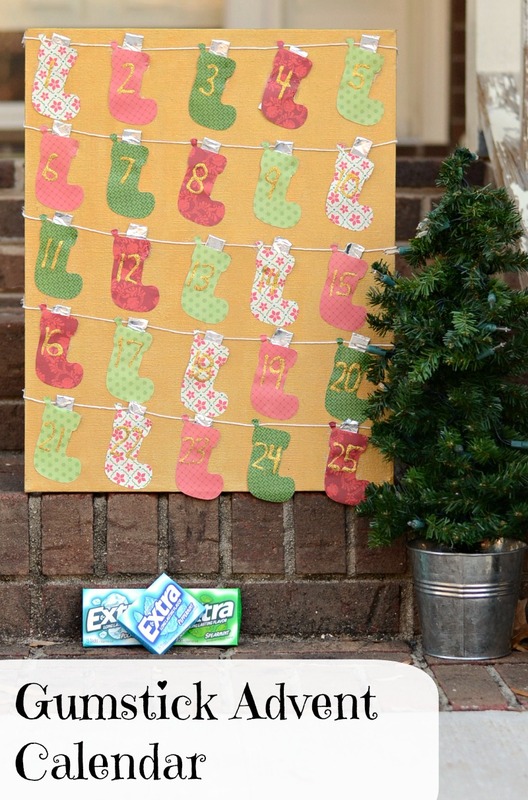 Want to make a Gum stick advent calendar? I bet you already have many of the supplies around the house! 16×20 canvas- I pre-painted mine gold. 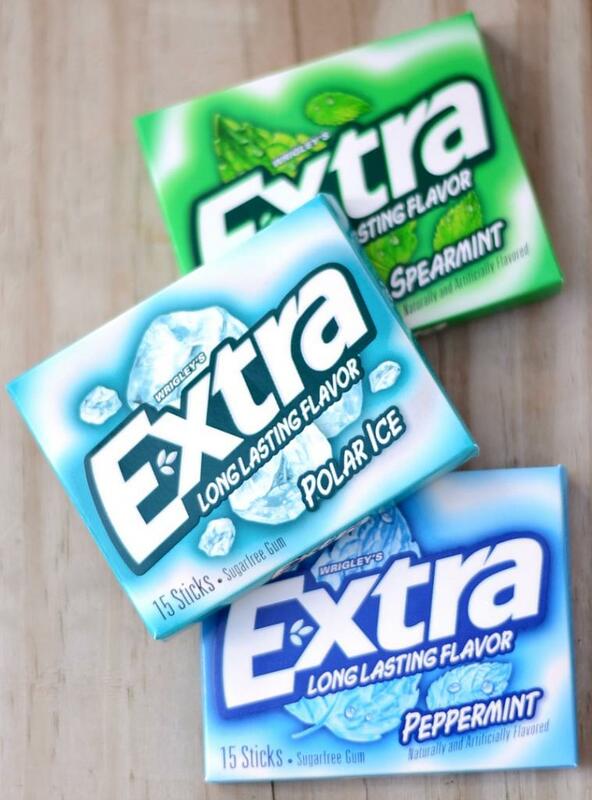 Extra Gum sticks in Polar Ice, Spearmint, or Peppermint- I chose all three to have a fun ‘surprise’ variety for my calendar! Technically, though, this craft only calls for 2 packs (there are 15 sticks per pack). 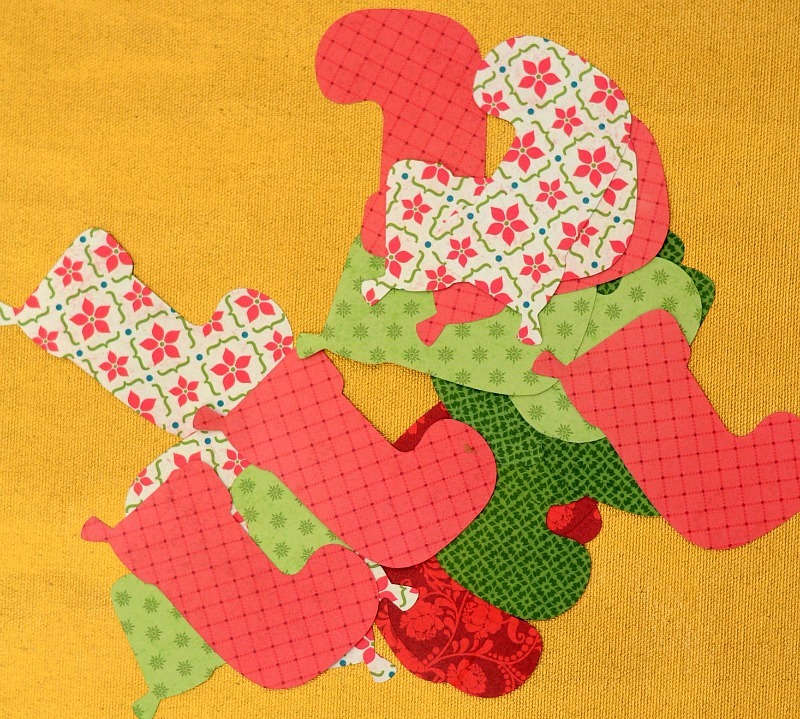 Begin by cutting out 25 stocking shapes. I cheated and used a Cricut, but it’s not necessary. I included a simple hand drawn stocking shape for your use, if desired. On the Cricut, my stocking shape was from the Christmas Card cartridge, and I had my settings on 4 1/4″ real dial size. I used five different colors of scrapbook paper just to make it easy. Line up the stockings in rows of five on the canvas. Do a dry run to make sure the spacing is correct prior to gluing. I did mine a little off kilter. Stockings are never hung perfectly straight, right? To hot glue the stockings on the canvas, carefully apply hot glue to only the outer edges. Make sure not to glue the entire thing or the gum stick won’t fit in the stocking. Press the stocking onto the canvas. Do this with all 25 stockings. My stockings had a little hanger edge, so I ran a string under them to create the look of the stockings hanging. Hot glue the ends on each row and under the stocking hanger portion.This step is totally optional. 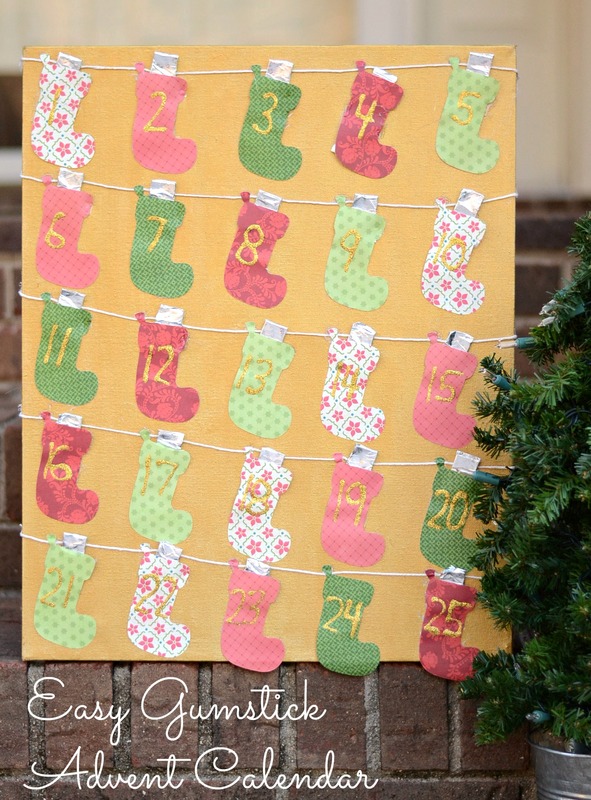 Use the glitter glue to write each day’s number on the stockings. Insert one stick of Extra gum into each stocking. Now you can countdown Christmas and give a little Extra this year! 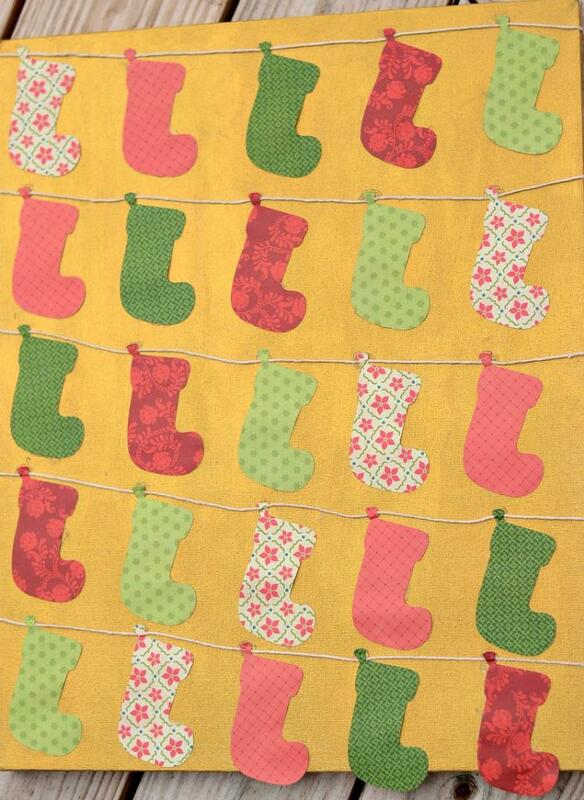 It Happens in a Blink Time Frame: Honestly, the time frame for this project will depend on cutting the stockings. Using a die cutter or pre-cut shapes will cut obviously shorten the project time. Using die cut shapes and a pre-painted canvas, this project took about 30-40 minutes. 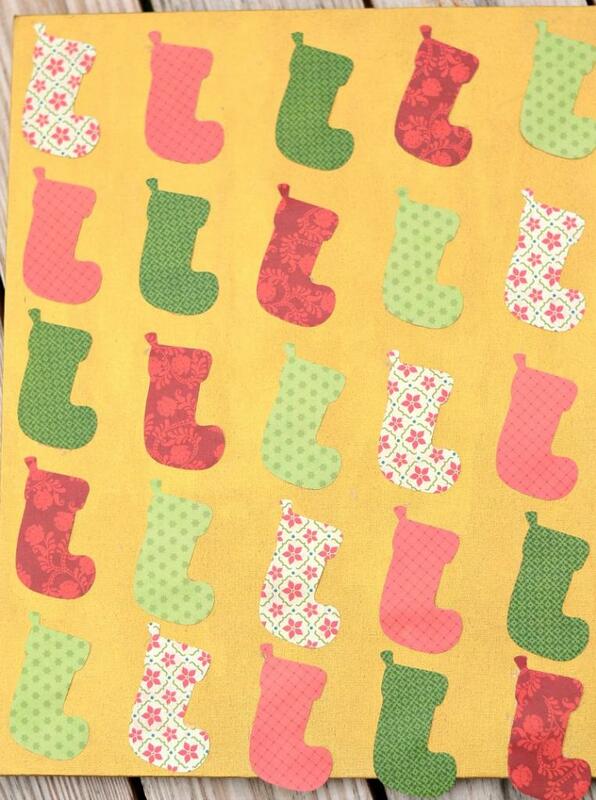 How the Kids Can Help: Let them pick out the scrapbook paper and organize the stocking patterns. I bought my Extra gum in the checkout aisle at Walmart. 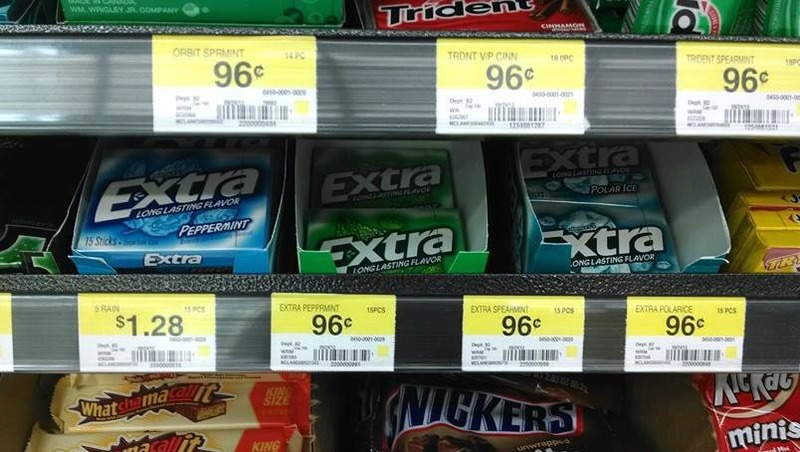 Buy some there and learn more about Extra Gum on their Facebook page! 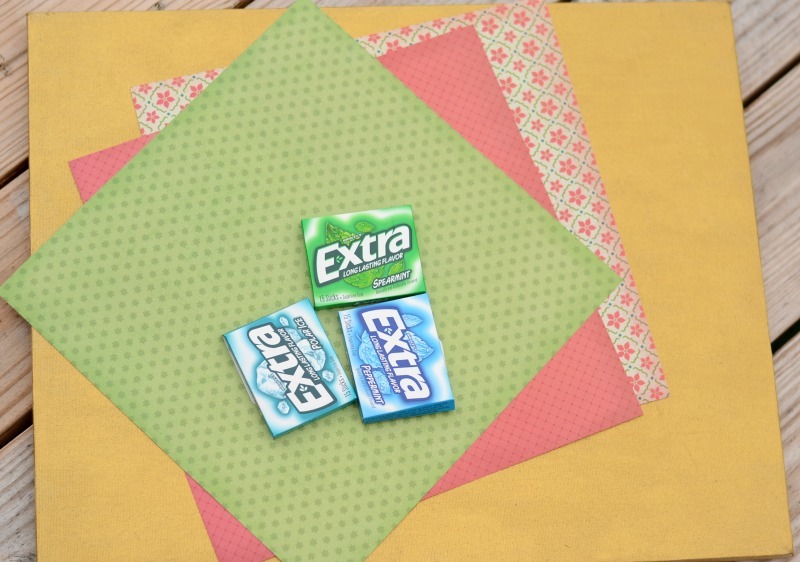 What other holiday ideas would you use Extra gum for this year? Maybe stocking stuffers? Teacher gifts? I’d love to hear your ideas on how to give Extra this holiday season! Cute idea! This is one that kids will look forward to when they see they get some gum every day! LOL. We do Advent calendars every year and this is definitely a creative one! Thanks for sharing! Melanie, having an advent calendar with sticks of gum is brilliant! That is such a cute idea!! My boys would love this – thanks for sharing! Pinned! Oh this is such a COOL idea! Love the creativity!! Thanks for the support! Glad that you liked it! Aww, not only is that an adorable idea, but (assuming your kids are old enough for gum) that is so smart to offer a treat that’s not just junk food! So cute! I love Advent! What a cute idea!! Connor would love this! Great idea for the kiddos! Such a unique idea for an advent calendar! What a cute idea and perfect to give kids a treat without giving them too much sugar! This is such a super cute idea! I love how it turned out. Great job.